Despite advances in immunosuppression and liver transplant in the past, mortality and morbidity caused by infections remain major problems. We present a 71-year-old man who was admitted to our internal intensive care unit with septicemia. Upon admission, he had poorly localized epigastric pain and fever of 2 days’ duration. Twenty years earlier, he had undergone an orthotopic liver transplant. Testing revealed a high C-reactive protein level, elevated liver enzymes, and an acute kidney injury. A computer tomography scan showed 2 circular, non—rim-enhancing, totally emphysematous intrahepatic lesions. Additionally, gas could be seen in the portal veins mainly, as well as in the biliary system, in the right auricle, and the splenic veins. To the best of our knowledge, he showed no malignant lesion or predisposing trauma. Empirically, treatment with broad-spectrum antibiotics was begun, and the patient was transferred to the operating suite. When surgery began, blood cultures revealed the presence of gram-positive bacilli, which were identified as Clostridium perfringens. Seven hours after the surgery, the patient developed asystole and died. In septic patients presenting with severe hemolysis, Clostridium perfringens infection must be considered in the absence of a malignant lesion or a predisposing trauma; a previous episode of gastroenteritis might be a predisposing trauma by impairing the barrier of the intestinal flora, leading to Clostridium perfringens infection. Despite advances in immunosuppression and liver transplant over past years, mortality and morbidity caused by infectious complications remain major problems. Up to two-thirds of all liver transplant patients had at least 1 episode of a severe infection.1 Opportunistic infections are uncommon beyond 6 months after liver transplant, especially in patients with good graft function because immunosuppression is tapered to a maintenance regimen. During this time, patients usually develop the same types of community-acquired infections seen in the general population, although at an increased rate.2 Transplant recipients may be more susceptible to some.3 Respiratory infections caused by pathogens such as Legionella, Streptococcus pneumoniae, and Haemophilus influenzae can be life-threatening disorders, if not treated promptly. Therefore, extensive clinical work-up of transplanted patients presenting with septicemia is mandatory. In September 2012, a 71-year-old white man with septicemia was admitted to our internal intensive care unit. On admission to the hospital, the patient had poorly localized epigastric pain and fever of 2 days’ duration. He had been well 48 hours before coming to the hospital. No significant travel history or exposure to toxins was reported. About 8 weeks earlier, he had an episode of gastroenteritis and herpes zoster infection of the right thorax wall. Twenty years earlier, the patient had undergone an orthotopic liver transplant because of alcoholic cirrhosis. His current immunosuppression therapy was stable, long-standing, with cyclosporine 75 mg twice daily, and mycophenolate mofetil 500 mg twice daily. Until presentation, his cyclosporine level was acceptable (in the 68.6 nmol/L range), and he had a functioning transplant. On admission, his blood pressure was 110/73 mm Hg, his heart rate was 77 beats per minute, his temperature was 38.8°C, the respiratory rate was 34 inhalations per minute. Testing revealed leukocytosis 18.5 × 109/L (normal range, 4.5–11.0 × 109/L), and his transaminase levels increased dramatically (aspartate aminotransferase 42.7 μkat/L and alanine aminotransferase 11.6 μkat/L from aspartate aminotransferase 0.55 and alanine aminotransferase 0.37 one week earlier). His C-reactive protein was high 329.5 nmol/L (normal range, 0.76-28.5 nmol/L), and he had acute kidney injury giving him a serum creatinine level of 229.8 μmol/L (from a baseline of 106.1 μmol/L). He had severe metabolic acidosis with a pH value of 7.1, base excess was 19.5 mmol/L (normal range, 2.0-2.0 mmol/L), and his lactate level was 12.4 mmol/L (normal range, 0.6-1,7 mmol/L). Laboratory levels on admission were hemoglobin 112 g/L (normal range, 130-180 g/L), platelet count 157 × 109/L (normal range, 135-410 × 109/L), total bilirubin 63.2 μmol/L (normal range, 5-21 μmol/L,), alkaline phosphatase 4.2 μkat/L (normal range 0.2-2.0 μkat/L), and lactate dehydrogenase 58.6 μkat/L (normal range, 1.7-3.4 μkat/L). Blood cultures were collected pending results. He was transferred immediately to intensive care unit. Empirically, broad-spectrum antibiotic treatment with meropenem 1000 mg IV. Additionally, vigorous fluid resuscitation was started. An urgent computed tomography scan was performed that revealed 2 circular, non–rim-enhancing, totally emphysematous intrahepatic lesions; segment V/VI contained an 8-cm lesion; a smaller 4-cm lesion was located in segment VII (Figure 1). Additionally, gas was observed mainly in the portal veins and biliary system. 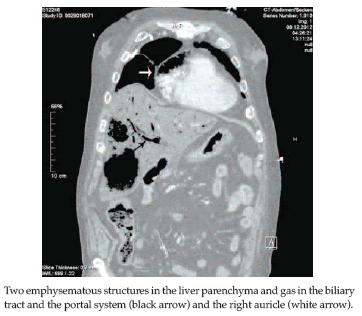 Gas collections were present in the right auricle and the splenic veins (Figure 2). The computed tomography scan results let us to suspect a gas-forming infection. The empirical anti-infective therapy was upgraded to metronidazole 500 mg, linezolid 600 mg, clindamycin 600 mg, and levofloxacin 500 mg, all administered intravenously. In addition therapy with fluconazole 400 mg intravenously was begun. Subsequently, the patient was intubated and mechanically ventilated. From the beginning of mechanical ventilation, inotropic support was given. Afterwards, the patient was immediately taken to the operating suite, where a laparotomy was performed. Macroscopically, the intraoperative situs showed multiple foci of parenchymal holes without the possibility of surgical cure. When surgery was begun, blood cultures revealed the presence of gram-positive bacilli and were identified as Clostridium perfringens. Seven hours after surgery, the patient developed asystole and died. Time from admission to the hospital until death was 13 hours. Clostridium perfringens is a ubiquitous, not absolute, anaerobe, and it is normal inhabitant of the human bowel and genital tract.4 Several risk factors for Clostridium perfringens septicemia exist; for example, malignancy with the presence of devitalized tissue, the elderly, persons with cirrhosis, and poorly controlled diabetes mellitus.5,6 The criterion standard for treating hepatic Clostridium perfringens infection is a liver transplant, which unfortunately, can only be performed in a small percentage of patients owing to the rapid progress of infection. Until now, 21 patients (including the current case) with liver abscesses caused by Clostridium perfringens has been presented in the literature.5,7-23 Regarding liver abscess caused by Clostridium perfringens after a liver transplant, our patient is the third case in the literature. As with the other published cases, on admission, the patient had clinical features consistent with Clostridium perfringens infection (i.e., abdominal pain, intravascular hemolysis, gas-forming liver abscess, and the presence of Clostridium perfringens in a blood culture). Compared with the other published cases, hepatic Clostridium perfringens infection in our patient occurred 20 years after an transplant in the liver orthotopic transplant (compared with 32 days after a liver transplant22 and 10 years after a transplant10) involving the right auricle of the heart and the spleen. Until now, the exact mechanism of hepatic Clostridium perfringens has remained unclear. Some authors have postulated that ascension of bacteria through the biliary tree into the liver causes a severe hepatic infection, especially in patients who have undergone a liver transplant and are taking immunosuppression. To the best of our knowledge, our patient showed no malignant lesion or predisposing trauma. Remarkably, he had 1 episode of gastroenteritis 8 weeks before admission. At the time, he had been on a more-intensive immunosuppressive regimen (cyclosporine and mycophenolate mofetil) than the patient in the Jones and associates report (who was taking cyclosporine and steroids).10 Therefore, it could be hypothesized that the ascension of the bacteria using the biliary tract or the portal system seems most likely. In manner the previous episode of gastroenteritis had resulted in an impaired barrier of intestinal flora leading to the infection remains unclear. Overall, the high mortality of hepatic Clostridium perfringens infections is high (13 out of 20 patients had died). All published cases of Clostridium perfringens septicemia after a liver transplant, including ours, have died. This underscores the importance of a multidisciplinary team approach involving surgeons, physicians, and radiologists. Winston DJ, Emmanouilides C, Busuttil RW. Infections in liver transplant recipients. Clin Infect Dis. 1995;21(5):1077-1089; quiz 1090-1091. 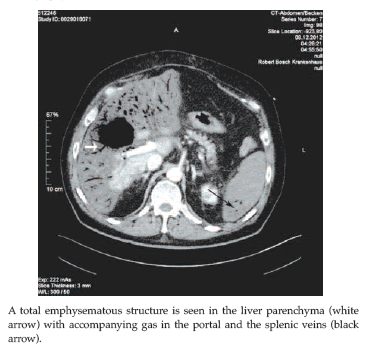 Singh N, Muder RR, Yu VL, Gayowski T. Legionella infection in liver transplant recipients: implications for management. Transplantation. 1993;56(6):1549-1551. Hatheway CL. Toxigenic clostridia. Clin Microbiol Rev. 1990;3(1):66-98. Law ST, Lee MK. A middle-aged lady with a pyogenic liver abscess caused by Clostridium perfringens. World J Hepatol. 2012;4(8):252-255. Schröpfer E, Rauthe S, Meyer T. Diagnosis and misdiagnosis of necrotizing soft tissue infections: three case reports. Cases J. 2008;1(1):252. doi: 10.1186/1757-1626-1-252. Bätge B, Filejski W, Kurowski V, Klüter H, Djonlagic H. Clostridial sepsis with massive intravascular hemolysis: rapid diagnosis and successful treatment. Intensive Care Med. 1992;18(8):488-490. Rogstad B, Ritland S, Lunde S, Hagen AG. Clostridium perfringens septicemia with massive hemolysis. Infection. 1993;21(1):54-56. Gutiérrez A, Florencio R, Ezpeleta C, Cisterna R, Martínez M. Fatal intravascular hemolysis in a patient with Clostridium perfringens septicemia. Clin Infect Dis. 1995;20(4):1064-1065. Jones TK, O'Sullivan DA, Smilack JD. 66-year-old woman with fever and hemolysis. Mayo Clin Proc. 1996;71(10):1007-1010. Eckel F, Lersch C, Huber W, Weiss W, Berger H, Schulte-Frohlinde E. Multimicrobial sepsis including Clostridium perfringens after chemoembolization of a single liver metastasis from common bile duct cancer. Digestion. 2000;62(2-3):208-212. Kreidl KO, Green GR, Wren SM. Intravascular hemolysis from a Clostridium perfringens liver abscess. J Am Coll Surg. 2002;194(3):387. Pichon N, François B, Pichon-Lefièvre F, Vincensini JF, Cessot F, Sautereau D. Hepatic abscess from Clostridium perfringens septicemia [in French]. Gastroenterol Clin Biol. 2003;27(2):237-238. Quigley M, Joglekar VM, Keating J, Jagath S. Fatal Clostridium perfringens infection of a liver cyst. J Infect. 2003;47(3):248-250. Au WY, Lau LS. Massive haemolysis because of Clostridium perfringens [corrected] liver abscess in a patient on peritoneal dialysis. Br J Haematol. 2005;131(1):2. Erratum in: Br J Haematol. 2006;132(6):805. Fondran J, Williams GB. Liver metastasis presenting as pneumoperitoneum. South Med J. 2005;98(2):248-249. Daly JJ, Haeusler MN, Hogan CJ, Wood EM. Massive intravascular haemolysis with T-activation and disseminated intravascular coagulation due to clostridial sepsis. Br J Haematol. 2006;134(6):553. Ohtani S, Watanabe N, Kawata M, Harada K, Himei M, Murakami K. Massive intravascular hemolysis in a patient infected by a Clostridium perfringens. Acta Med Okayama. 2006;60(6):357-360. Loran MJ, McErlean M, Wilner G. Massive hemolysis associated with Clostridium perfringens sepsis. Am J Emerg Med. 2006;24(7):881-883. Merino A, Pereira A, Castro P. Massive intravascular haemolysis during Clostridium perfrigens sepsis of hepatic origin. Eur J Haematol. 2010;84(3):278-279. doi: 10.1111/j.1600-0609.2009.01337.x. Meyns E, Vermeersch N, Ilsen B, Hoste W, Delooz H, Hubloue I. Spontaneous intrahepatic gas gangrene and fatal septic shock. Acta Chir Belg. 2009;109(3):400-404. Bradly DP, Collier M, Frankel J, Jakate S. Acute Necrotizing Cholangiohepatitis With Clostridium perfringens: A Rare Cause of Post-Transplantation Mortality. Gastroenterol Hepatol (N Y). 2010;6(4):241-243. Rajendran G, Bothma P, Brodbeck A. Intravascular haemolysis and septicaemia due to Clostridium perfringens liver abscess. Anaesth Intensive Care. 2010;38(5):942-945.